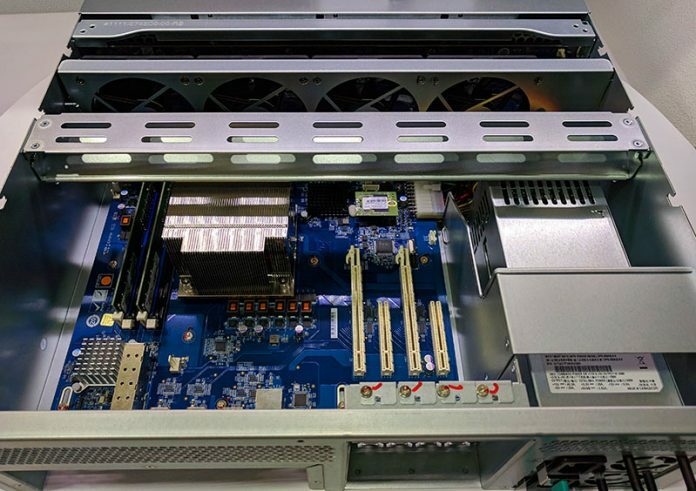 If you are looking for a rackmount NAS, and want an alternative to Intel, QNAP has a new offering we spotted at Computex 2018. The QNAP TS-1677XU is a 3U rackmount NAS. 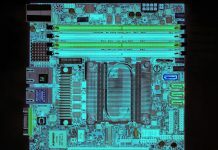 Inside is something that we have just started to see, an alternative to Intel x86 architectures. The QNAP TS-1677XU supports AMD Ryzen CPUs. Looking at the front of the unit, one can see a 4×4 array of drives. This configuration yields 16 front hot-swap drive bays. With today’s hard drive capacities this yields over 200TB of capacity. Moving to the rear, we see expected features of this class of NAS. There are redundant PSUs. Beyond this, there are dual 1GbE and dual SFP+ 10GbE ports. Great job to QNAP on making 10GbE standard on this NAS and built-in. One can see the four full-height expansion slots. 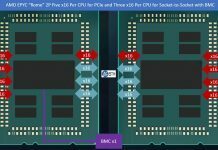 Since QNAP is using AMD Ryzen, they have four expansion slots. This is a major benefit over lower-end NAS units that have one or two expansion slots. 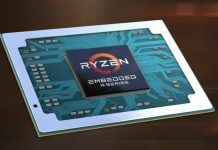 The AMD Ryzen CPU is housed under a large heatsink. One can also see the custom motherboard with networking, USB 3.0, optimized cable headers, and even a spot for a USB DOM that is used for QNAP’s OS. There are two ADATA DIMMs. We asked QNAP’s booth team and they did not think they would support ECC in the four slots. One can fit up to 64GB of DDR4 in these slots. ADATA makes a number of RAM and DOM modules. 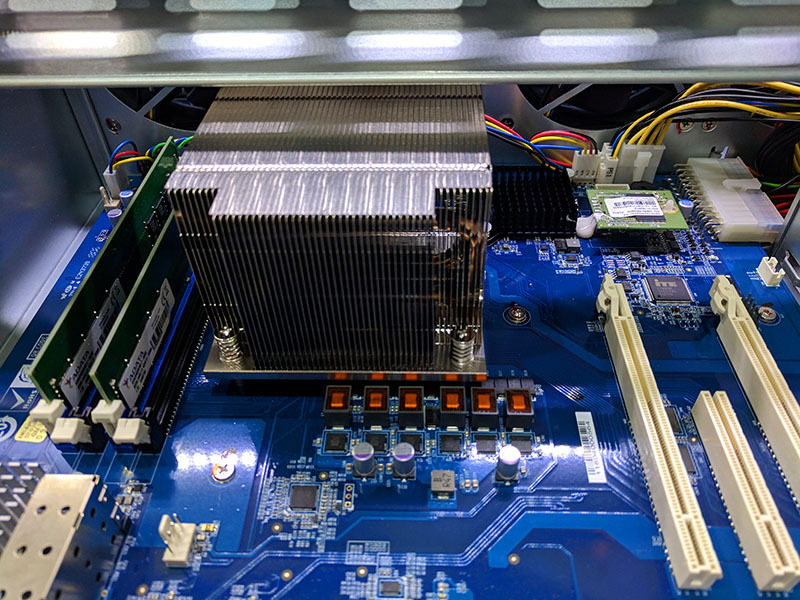 You can read our recent coverage of them at ADATA Shows off SSD and NVDIMM Line at Computex 2018. The QNAP TS-1677XU supports AMD Ryzen 7 1700 to Ryzen 3 1200 CPUs. The company also had a smaller model on display that focused on Ryzen 5 and Ryzen 3 support. We really like QNAP’s inclusion of SFP+ 10GbE networking on these units. SFP+ enabled 1GbE switches and 10GbE switches, in general, have plummeted in price and power consumption to the point where we are using 10GbE as our base expectation for NAS units in 2018. Great job by QNAP supporting this industry trend. I wish both Qnap, Synology and Drobo etc focused more on data density. 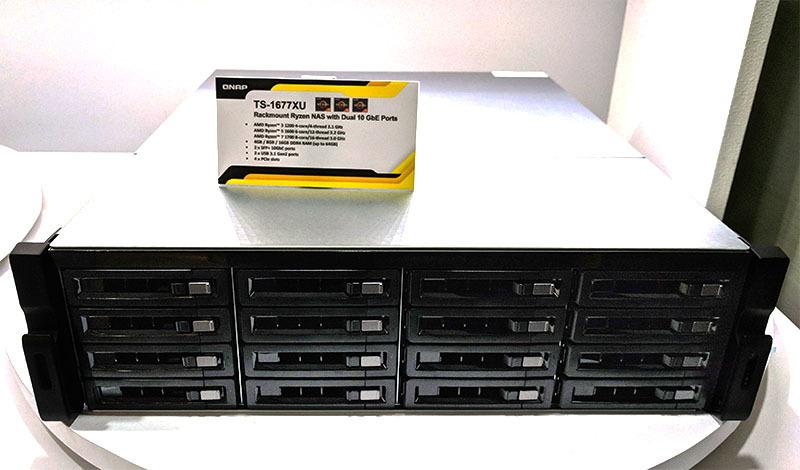 If they made a flat-pack they could fit just as many drives in 1U and still be easily serviceable with a drawer design like the QuantaGrid D52T-1ULH but with the storage capacity of the Gigabyte D120-C21. looks like they will have a 24 bay model and a 1U model with 9 bays as well.